I wasn't aware that World Read Aloud Day is celebrated every first Wednesday of March. Thanks to The Learning Basket’s status update in Facebook last March 5 and Mariel’s video of her reading aloud The Gruffalo by Julia Donaldson, we can now mark this as one of our family's special day. Before I saw their helpful posts on Read Aloud Day, I was so glad to have taken these photos of Tatay reading books to Rio that morning. Here’s the back story on these photos. After helping Tatay fix the bed, Rio took his “Train Stories” book and asked (hmm, demanded,may be the right term) his Tatay to sit beside him and read the book. Both of us were running late and getting ready to leave the house but we chose to stay and give in to our little boy's demand. 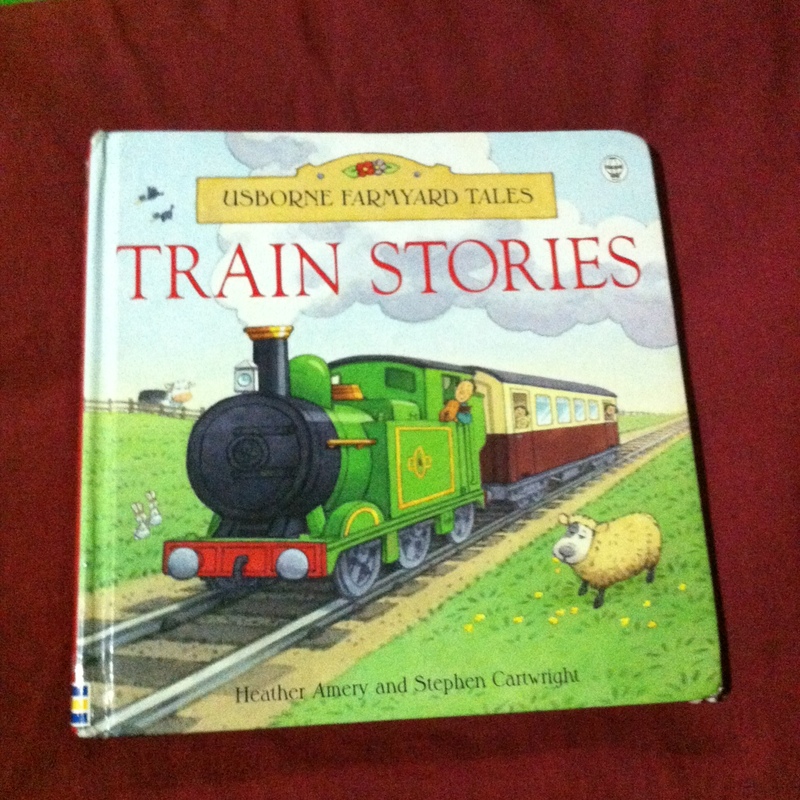 After reading his current favorite train book, Rio asked Tatay to read another book. This time he handed Eric Carle's Brown Bear, Brown Bear, What do you see? 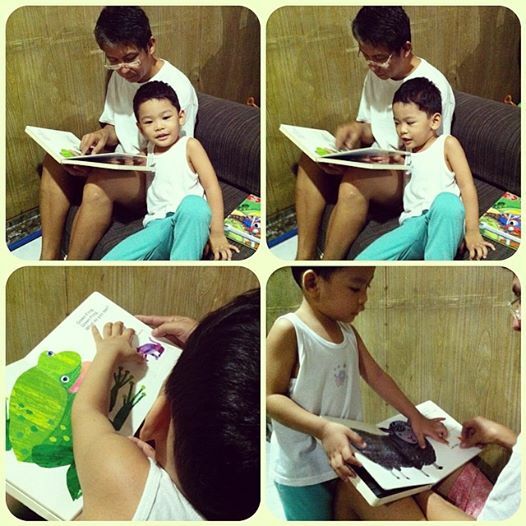 I asked Tatay to let Rio do the "reading" himself. We were so happy to hear Rio "read"! 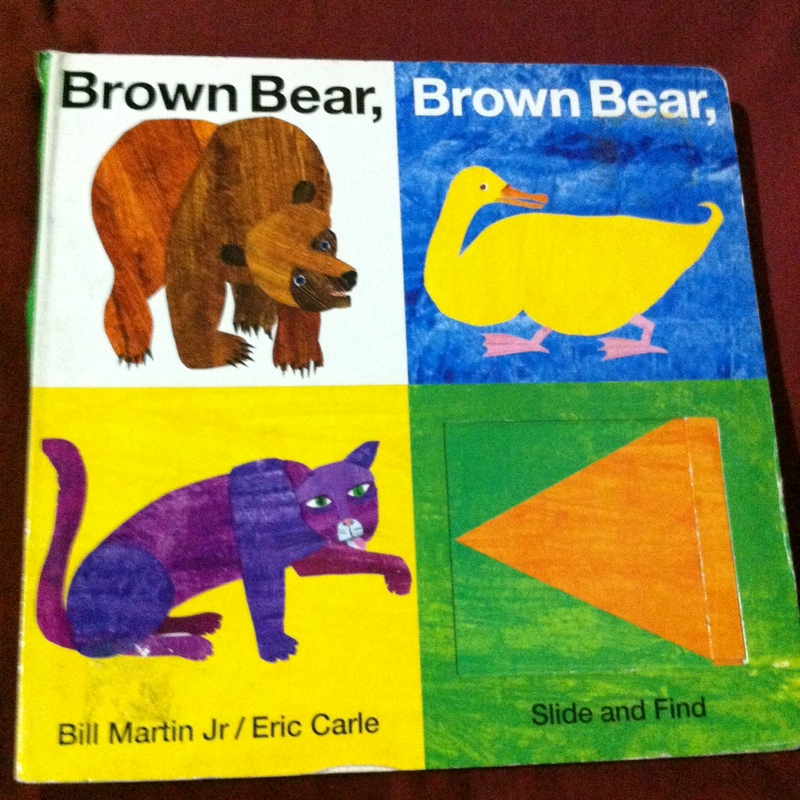 We used to read this book by asking Rio to name the animals and their colors. Constant read aloud sessions with our son paid off! He can now say all the animals and their colors - from the brown bear, purple cat, gold fish up until the teacher who saw the children! We were lucky to find this interactive version of the book. The windows (slide and find at the right bottom) added to Rio's curiosity and excitement in answering the question "what do you see?" in every page. UPDATE! Just last night during our story time, Rio did not just identify the animals and their colors. He “read” the entire book all by himself! Yey! We were so happy to hear our son "read aloud"! Cheers to more read aloud moments! WORKSHOP ALERT & INVITATION! My friend Joy and I will be attending The Learning Basket’s Starting your Preschool Homeshool : A Practical Workshop tomorrow, March 8, 9:00 a.m. – 11:30 a.m. at the Medela House in Quezon City. I’m so excited to hear tips,stories and suggestions from fellow moms who are thinking of homeschooling their children in their preschool years. I'm very eager to start our homeschool project but still doesn't know how and where to start. The first time I attended a workshop organized by The Learning Basket (you can read my experience here ) last year, I was totally inspired to collect books for Rio and resolved to make reading a way of life for the whole family. So, if you’re attending tomorrow’s workshop, please say hi and let’s all be partners in raising happy readers! Nanays, what are your favorite read aloud stories to your child? Let’s share our picks and hopefully our read aloud videos soon. Last note, I saw this Gruffalo website while doing this post and looking for articles on World Read Aloud Day. Listen with your child as Julia Donaldon and her husband sing the The Gruffalo’s Child Song and more. Kakaaliw! Hi Nathalie! Thanks for dropping by. Yes, no rush din ang mode ko when it comes to Rio learning to read. Let's just enjoy our read aloud moments with our children. I'll share the tips and suggestions I'll get from tomorrow's workshop. May 5/48 entry ka na? Ako, wala pa. Uh, no. I forgot. :P Haha. Will be posting my 5/48 on Monday na. Hi, Ms. Nadia. It was really my pleasure to meet you and Ms. Joy in this morning's event. :) My little Miah is fond of mimicking how I read to her. Though it's not really "reading," I would hear her pronouncing some words in the book. That always makes my day :). I really enjoyed our short post-workshop lunch date and getting to know you moments last Saturday. Let's set a playdate or a mommy "us time" soon! Hello to you little Miah and to your family! ang galing naman! i want to raise baby A din ng mahilig magbasa ng books. She's 1 year old na, and she can identify na animals and read vowels sa books na binili namin sa kanya. She points the object tapos sasabihin nya kung ano yun.Iba talaga ang pag expose sa mga bata sa hilig sa pagbabasa. Makikita mo yung eagerness nilang matuto. Hi Mary Joy! Thanks for dropping by. Galing ni Baby A! Galing din siyempre ni Mommy! Medyo matagal na akong hindi nakakapag-post ng mga read aloud moments namin ni Rio. I will share it asap here on the blog. His current fave book is Papa, Please Get the Moon For Me by Eric Carle :) Happy that you like the blog, Mary Joy.